Whether you supported one or the other options available last Thursday, or like 30% of the population you didn`t consider it worthwhile voting – or maybe as a non-UK citizen you didn`t have the right to vote – extra parliamentary politics is where the Moles believe we need to do our digging. This is where the conflict at the basis of this debate can find an alternative resolution, and way forward. This is where a much stronger social movement is needed, a social movement that can counteract the drift towards racism in part of the working class. One such space of struggle, largely ignored by mainstream media and politics, has long been that created by the criminalisation of welfare. In the last decade Jobcentres and disability benefit assessment centres have become increasingly environments of control and destitution, humiliation and alienation – as the comment by Peter N on our first column describes. But it doesn`t have to be like this. This is where benefit claimants, disabled people and migrants can find common cause, and take action together. Building bridges between migrants, disabled and unemployed struggles is not going to be an easy task – but cannot be more difficult than turning the Labour party into a revolutionary socialist organisation! And so in the following paragraphs we bring you a story of solidarity and working class struggle that you will not hear on Newsnight this week. Following the Britain-wide activity on 9 and 23 June against the arrest and trial of activist Tony Cox, grass-roots disability groups are now preparing another UK-wide day of action, against unfair Personal Independence Payment assessments. 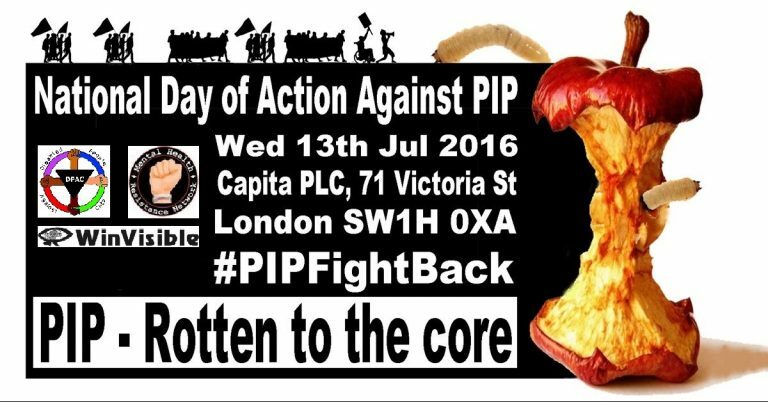 On 13 July disabled people, unemployed workers and claimants will descend on assessment centres all over the country to protest against the sham and brutal PIP claiming process. A process that has already deprived thousands of disabled people of entitlement to necessary support. Personal Independence Payment (PIP) is supposed to help with of the extra costs incurred by those of us living with long-term disability, ill-health or terminal ill-health. Since 8 April 2013 the DWP has been replacing Disability Living Allowance for working age people with PIP, forcing disabled claimants to undergo extremely stressful review assessments. This has reduced the prospectof disabled people’s claims being successful. First, the assessments carried out by corporate companies such as Capita and Atos have been exposed as sham. Assessors and decision-makers have the power to arbitrarily grant or deny eligibility. No matter how strong a letter of support you hold from your GP or specialist, the PIP assessors’ judgment is the only one that counts. (The DWP decision-makers rubber stamp the verdict of the PIP assessor from ATOS or Capita). The brutality of such judgementsis shown by statistics revealing that the switch from DLA to PIP has resulted in 27% of those who havefaced re-assessment suffering a complete loss ofthis benefit. With many people still to be assessed, the disturbing news is that the latest figures show the numbers losing benefit are growing. The rate of success for new claims for PIP is also falling – in April 2016 only 43% of new claims were successful. Secondly, people’s chances of being awarded PIP are diminished through the structure of the very process of challenging decisions. You used to be able to directly appeal against a decision to deny DLA. Now, with PIP – and also, now, with all benefits – you have to go through a process of internal review with the DWP first. This is called a Mandatory Reconsideration. This is part of a wider picture of cuts that are not only unfair, but unashamedly targeted against people in poverty and disabled people. This is obvious to all of us who have had the misfortune to have dealings with the DWP. It has also been denounced by the Centre for Welfare Reform in a recent report. This conclusively proves that social care cuts, benefit cuts, housing cuts and regressive tax increases haveunfairly targetted the poorest. These measures have placed a burden onpeople in poverty and on disabled people, which is respectively 5 times and 9 times more than the burden placed on most other citizens. In facing such a brutal attack as unemployed workers, sick and disabled people, however, we are not victims, as the DWP – and the capitalism they are an expression of – would want us to be. Rather, we are fighters whenever we stand up for our rights, whenever we seek solidarity from welfare action groups, and whenever we show solidarity to one another. The case of Tony Cox – see our last column – illustrates that this strategy is already being successful. Tony, an activist with Scottish Unemployed Workers Network (SUWN) was arrested at the Maximus Assessment Centre in Dundee while accompanying a vulnerable woman to her work capability assessment. Tony was found guilty of threatening behaviour, despite the woman’s own statements in Tony’s defence. In SUWN’s own words, ‘Tony was giving his time to help someone through the thicket of a punitive government bureaucracy… but now another part of that bureaucracy has determined to punish and criminalise him. Tony faces sentencing on 21 July. The sheriff’s verdict is only proof that the DWP are becoming scared of groups like SUWN in Dundee, ECAP in Edinburgh, and many more, who are building a counter-power through accompanying and giving solidarity to claimants at disability benefits assessments, and through front-line advocacy at jobcentres. This process creates relations of practical solidarity, overcoming the isolation many claimants feel. It empowers people with information to realise how to resist the wrongs on which the benefits system currently relies, and the traps it lays for claimants at all stages of claiming and receiving benefits – starting with PIP. And despite the verdict against Tony, this vital solidarity can and must grow. Now that important welfare powers are being devolved, it is first of all through direct and solidarity action that we can force the Scottish Government to get rid of the rotten assessment and claiming process that is PIP, and to make true their claim to a concern for social justice. Because, as Tony said after the trial, no justice, no peace. On 13 July welfare activists groups will be demanding not only that #AdvocacyIsNotACrime, but also that the corporate assessors for PIP #DoNoHarm, responding to the call to action issued by Disabled People Against Cuts. Disabled people, unemployed workers and claimants will descend on assessment centres round the UK to protest against the sham and brutal PIP claiming process, which has already deprived thousands of disabled people of entitlement to necessary support. A list of protests can be found on DPAC’s website here, including the Glasgow action. Keep an eye on ECAP’s Facebook to check if there will also be an Edinburgh demo, or if we will be joining our comrades in Glasgow. The Tribe of Moles will only emerge if we refuse predetermined and pre-confectioned analysis of what the working class is and does. If we abandon such certainties and start to think in terms of multiple and ever changing processes of the composition of our class, then we can create new routes by digging away the walls that capital constructs to divide and rule people into processes of exploitation. Comrades from Edinburgh Coalition Against Poverty and Action Against Austerity have been digging for a while, now is the right time to dig even harder and deeper.
" extra parliamentary politics is where the Moles believe we need to do our digging. This is where the conflict at the basis of this debate can find an alternative resolution, and way forward. "